How Good Is A Subaru STI At Being A Plane? Today we learned that United's 787 Dreamliner isn't exactly revolutionary, but it's quiet and fuel efficient. Could it really be as good on gas as, say, a Subaru STI? One of our readers decided to find out. I Was A Passenger On The First Boeing 787 Dreamliner Flight In The U.S. Reader schwartzi first wondered what kind of MPG the Dreamliner gets. That is 0.415 miles per gallon or 2.41 gallons per mile. Of course these calculations are for one person being on the plane for the trip. While this sounds like it'd be FREAKIN AWESOME, it's not exactly likely or relevant. Reader DarthToad found a much more apt comparison. 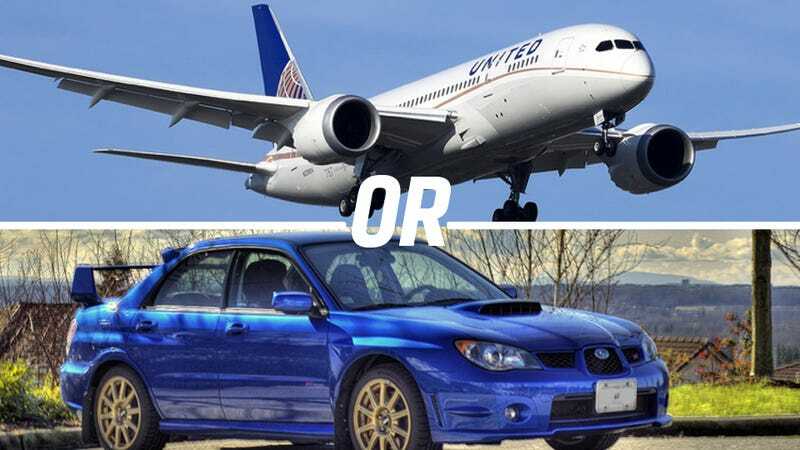 How does the Dreamliner compare to his Subaru STI, and how well could his Subaru do the job of the 787? In other math, I can fit 5 people max in my '06 STI and get 17mpg on a good day (with my driving style). So, per mile, I can move 5 people for 17 miles on 1 gallon. United's spec on the 787 is 219 passengers, and using your math, gets 0.267mpg. So, that plane can move 219 people (not counting flight crew) for .267 miles on 1 gallon. To move the same amount of people that a 787 can at once for 1 mile, my Subaru would need to make 44 round trips, or 88 one ways, at 17mpg. 88/17=5.17 gallons. The 787 in that same mile needs 3.74 gallons. 219 people via the Subaru is 219/5.17=42.35 people per gallon per mile. 219 people via the 787 is 219/3.74=58.55 people per gallon per mile. That's a lot more than I expected, if I'm honest. So there you have it, folks. If you need to move 219 people a long distance, you'll definitely want to buy a 787 over a Subaru STI. The question remains, which one is more fun to drive?